In 2007, chef Grant Achatz seemingly had it made. He had been named one of the best new chefs in America by Food & Wine in 2002, received the James Beard Foundation Rising Star Chef of the Year Award in 2003, and in 2005 he and Nick Kokonas opened the conceptually radical restaurant Alinea, which was named Best Restaurant in America by Gourmet magazine. Then, positioned firmly in the world's culinary spotlight, Achatz was diagnosed with stage IV squamous cell carcinoma-tongue cancer. The prognosis was grim, and doctors agreed that the only course of action was to remove the cancerous tissue, which included his entire tongue. Desperate to preserve his quality of life, Grant undertook an alternative treatment of aggressive chemotherapy and radiation. But the choice came at a cost. Skin peeled from the inside of Grant's mouth and throat, he rapidly lost weight, and most alarmingly, he lost his sense of taste. Tapping into the discipline, passion, and focus of being a chef, Grant rarely missed a day of work. He trained his chefs to mimic his palate and learned how to cook with his other senses. As Kokonas was able to attest, the food was never better. Five months later, Grant was declared cancer-free, and just a few months following, he received the James Beard Foundation Outstanding Chef in America Award. Life, on the Line tells the story of a culinary trailblazer's love affair with cooking, but it is also a book about survival, about nurturing creativity, and about profound friendship. Already much-anticipated by followers of progressive cuisine, Grant and Nick's gripping narrative is filled with stories from the world's most renowned kitchens-the French Laundry, Charlie Trotter's, el Bulli-and sure to expand the audience that made Alinea the number-one selling restaurant cookbook in America last year. 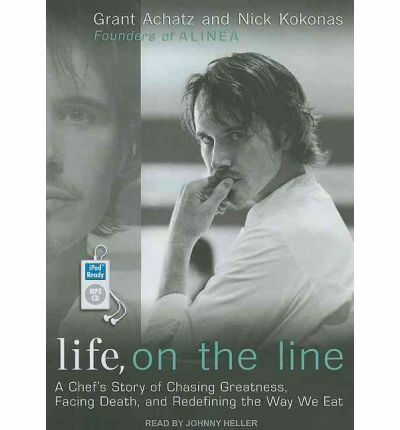 About the Author: Grant Achatz is an award-winning chef and the owner of the restaurant Alinea in Chicago. He won the Rising Star Chef of the Year Award in 2003 and was named Best Chef in the United States in 2008 by the James Beard Foundation. Alinea was named best restaurant in America by Gourmet magazine and was added to Restaurant magazine's list of top fifty restaurants in the world, eventually making it to number seven. Grant has written for Gourmet and the New York Times Diner's Journal, and he is a columnist for the Atlantic's Food Channel. Nick Kokonas is a managing partner of Achatz LLC, which was formed to envision, create, and manage the restaurant Alinea in Chicago. Together with award-winning chef Grant Achatz, Nick coordinated the creation of Alinea, including the formation and execution of the business plan, hiring of all professional trades, and management of ongoing operations. Prior to his involvement with Alinea, Nick spent over a decade as a derivatives trader, founding his own proprietary trading firm in 1994. He has been an investor in, and adviser to, a number of mid-size technology firms, and he currently serves on several corporate boards. Nick holds a B.A. in philosophy from Colgate University. Johnny Heller has won two prestigious Audie Awards and has earned numerous Audie nominations. He has been praised for his adult, personal development, history, comedy, and children's book narrations. Named a Best Voice of 2008 and 2009, as well as one of the Top 50 Narrators of the Twentieth Century by AudioFile magazine, Johnny has earned almost twenty Golden Earphones Awards . Two of Johnny's audiobooks have been picked by AudioFile as Best Audiobook the Year, and he has won two Publishers Weekly Listen-Up Awards. Note: the formatting of this mp3 audiobook is mp3-cd. This indicates it will only run on computer systems with CD-ROM or DVD drives or CD players that are equipped to play mp3-cds. It can however be replicated from a computer system to an mp3 player like an iphone ipad sony rockbox ipod sandisk or similar player.